It's alarming. And urgent. Elephants across Africa are being slaughtered in record numbers for their tusks, which are then shipped to Asia (primarily China) to meet the growing demand for ivory. The situation continues to worsen, with poachers now using helicopters, night vision goggles and automatic weapons. Tens of thousands of elephants are killed each year in Africa, more than 100 a day. 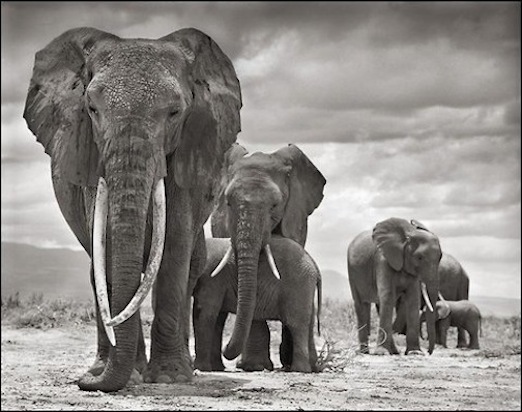 The image above was taken by photographer Nick Brandt just two weeks ago in Amboseli, Kenya. The day after the photo was taken, Qumquat, the matriarch elephant pictured, along with her herd, were killed for their ivory. Last week, Secretary of State Hillary Rodham Clinton, committed the U.S. to to do more to combat the illegal wildlife trade. A step in the right direction, but more needs to be done. To learn more about this important issue, check out this New York Times article here. To help, go to Big Life Foundation here.